With SMRT apologising and taking responsibility for the Tuesday accident that killed two workers, let's not forget that this is not the first time that an SMRT worker has been killed on the job. 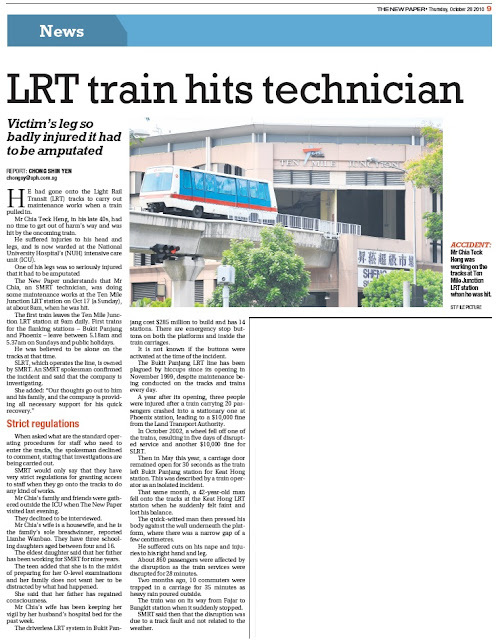 On Oct 17, 2010, Mr Chia Teck Heng, 48, was deployed by SMRT to attend to problems caused by a trip in the power supply at the Phoenix LRT station in Bukit Panjang. 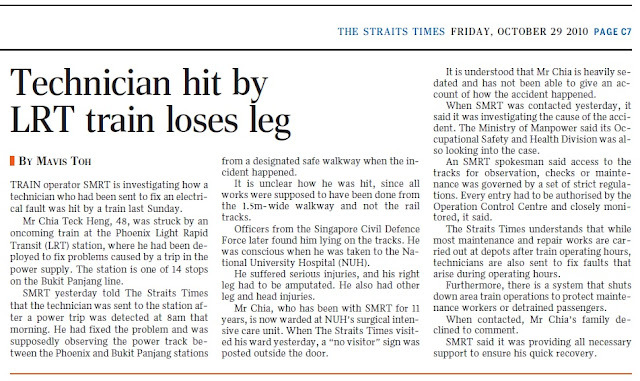 He was on a designated walkway when he was hit by an oncoming train at 8.55am. He died 12 days later in NUH. 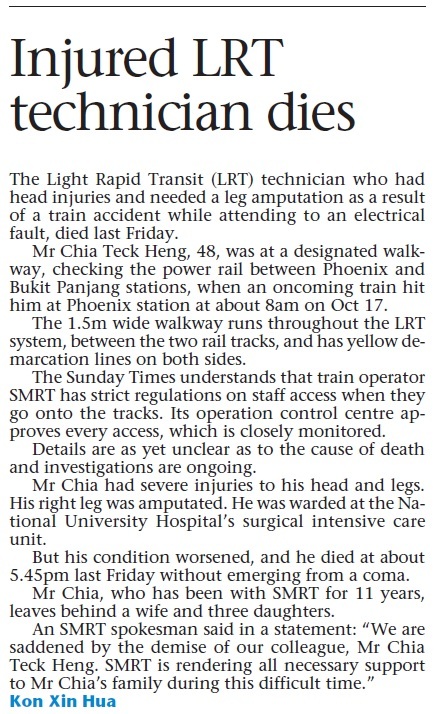 Unlike the two recent deaths, there seemed to be little interest in how Mr Chia was killed. 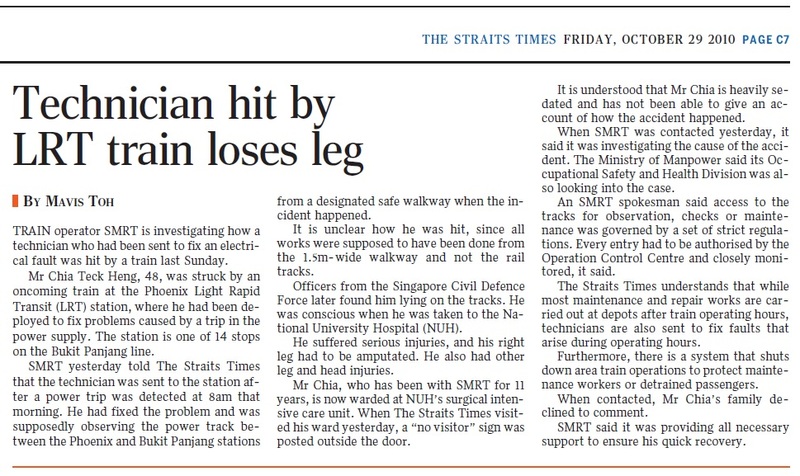 All SMRT said was that it was investigating the cause of the accident and that was it. 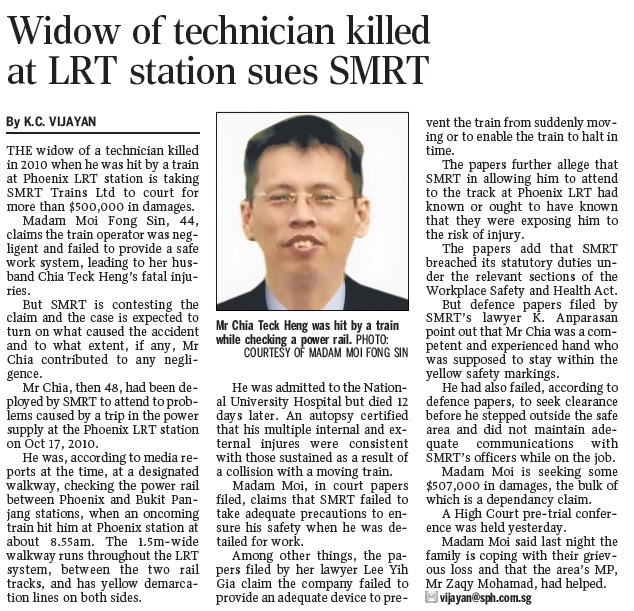 There were no further news reports on the case until two years later when Mr Chia's widow, Madam Moi Fong Sin, sued SMRT for more than $500,000 in damages, claiming SMRT was negligent and failed to provide a safe work system, leading to her husband’s fatal injuries. That was in 2012. The outcome of the lawsuit has never been reported. Scroll down for a 2014 video of a Janet Moi Fong Sin, whose husband "met with an accident at work" and "passed away".